The Islamic State, the savage militant group wreaking bloody havoc across the Middle East, has purportedly stooped to a brand new low by recruiting Western women to its heavenly cause with promises of earthly delights. According to CNN anchor Carol Costello, the marketing team at the Islamic State (IS, formerly ISIS) is attempting to lure female heathens into its ranks with promises of sugar-drenched chocolate spread and cute kittens. Yes, true to their reputation for unspeakable cruelty and wickedness, the fundamentalists have found the Achilles heel of the West: namely, Western women and their apparent addiction to high-fat, sodium-based snack foods, compounded by an obsession for adorable kittens. Not to mention smiley emojis! “How do you relay your message of jihad in a way Westerners understand?…They are turning to the language of social media and that seems to be working just fine for ISIS. “ISIS is talking online about jars of Nutella, pictures of kittens and emojis,” Costello asserts. “They want people to believe their life on the battlefield isn’t so different than yours. Let’s attempt to wrap our minds around Costello’s argument for a moment: Islamic State warriors, who’ve spared no cost, not to mention bloodshed, in professionally promoting an image of themselves as the most disgusting savages ever to set foot on Earth, now want us to believe that by pushing Nutella, images of furry kittens and smiley faces this will make us believe that “their life on the battlefield isn’t so different than yours”? 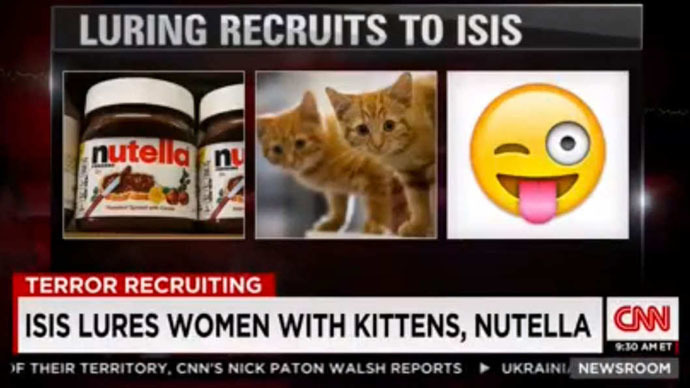 Joke as we will, that CNN chyron about kittens and Nutella was genius. That’s how you grab a viewer’s attention on a long-running story. For the uninitiated, Nutella is an Italian-produced hazelnut and chocolate spread that packs about 70 percent saturated fat and processed sugar by weight. And anybody who has Facebook is readily familiar with kittens, and the oddly bewitching effect these furry creatures have on Western women. The incredible, unconfirmed claims presented by Costello paved the way for an interview with Nimmi Gowrinathan, visiting professor from City College, New York, who got down to the brass tacks of discussing IS recruitment methods. Gowrinathan didn’t say if the impressionable young French women had inquired about Nutella and furry kittens. But at that point, many viewers had apparently already abandoned the show, taking to Twitter faster than you can say ‘pass the hazelnut spread’. @FearDept@AnonyOps@fabiomaster Oh yes, of course I'll sell my soul for Nutella. Because I'm just a woman. What do I know?